MDU (Maharshi Dayanand University) Rohtak Theory Datesheet for Exam November / December 2018. Date: 21th Nov 2018:- Theory date sheet of Master of Public Administration (Hons.) (5 year Integrated Course) 1st, 3rd, 5th, 7th & 9th Semester (Full/Re/Imp.) Exam. November, 2018. 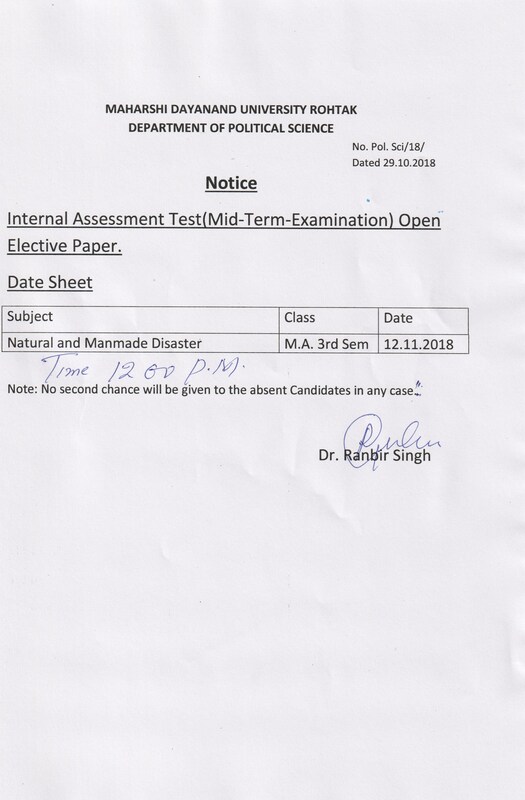 Date: 21th Nov 2018:- Theory date sheet of M.A. (Visual Arts) (6 Years Integrated Course) (Hons.) 1st, 3rd, 5th, 7th, 9th, & 11th Semester (Full/Re/Imp.) Examinations, November, 2018. Date: 21th Nov 2018:- Theory Date Sheet for Bachelor of Travel and Tourism Management (BTTM) 7th Semester Examinations Nov., 2018. Date: 06th Nov 2018:- Theory Date Sheet for B.Sc Sports Sci./B.P.E. 1st & 3rd Sem. & B.Sc. Sports Sci. 3rd, 5th (Regular & Re-Appear) & 6th Semester (Only Re-Appear) Examinations Nov, 2018. Date: 06th Nov 2018:- Theory Date Sheet for M.Li.Sci. 1st,3rd & 4th Semester Examinations Nov-2018. Date: 03rd Nov 2018:- Theory Date Sheet for B.B.A. LL.B 1st, 3rd & 5th Semester Examinations Nov., 2018.